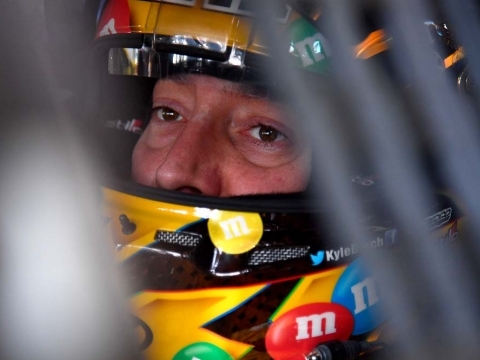 HUNTERSVILLE, North Carolina (Feb. 6, 2019) – As the 2019 Monster Energy NASCAR Cup Series season is set to begin with Speedweeks activities this weekend at Daytona (Fla.) International Speedway, Kyle Busch has turned his attention to filling the final empty spot in his trophy case. The trophy that Busch, driver of the No. 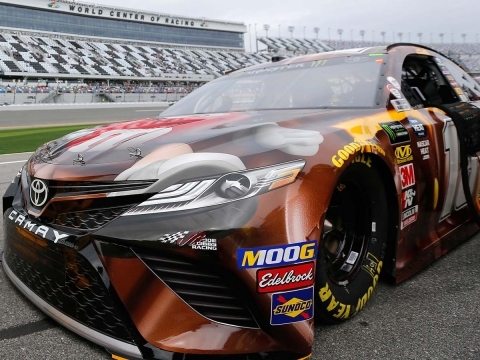 18 M&M’S Chocolate Bar Toyota for Joe Gibbs Racing (JGR), is hoping to finally secure is the Harley J. Earl Trophy that goes annually to the Daytona 500 winner as he makes his 14th career start in the “Great American Race” slated to run Sunday, Feb. 17. Busch is still searching for his first victory in NASCAR’s season-opening event, which would be one of the biggest accomplishments on his already impressive resume. The important race wins already checked off the list is housed in a large trophy case built at his Kyle Busch Motorsports race shop. The list starts with his 2015 NASCAR Cup Series championship trophy, along wins in crown jewel races starting with the Southern 500 at Darlington (S.C.) Raceway in 2008, back-to-back Brickyard 400s at Indianapolis Motor Speedway in 2015 and 2016, and last year’s first Cup points-paying win at Charlotte (N.C.) Motor Speedway in the Coca-Cola 600 on Memorial Day weekend. Along with his Coca-Cola 600 win at Charlotte that made him the first driver to win a Cup race at every track on the schedule, Busch added a few milestones to an already Hall of Fame-worthy career in 2018, including notching his 50th Cup Series win at Richmond (Va.) Raceway in September and bringing home career-high totals of 22 top-five finishes and 28-top-10s, along with tying his 2008 career high of eight victories in a season. Busch’s strong 2018 season netted a fourth-place finish in the final Cup Series standings after his 11th career appearance in NASCAR’s playoffs and fourth consecutive appearance in the Championship 4. Busch’s eight wins also continued his streak of at least one win in each of his first 14 seasons. The 2015 NASCAR Cup Series champion will be sporting an M&M’S Chocolate Bar scheme on his No. 18 Toyota for NASCAR’s season-opening race, as the new permanent addition to the brand’s iconic candy lineup will be highlighted throughout Daytona Speedweeks. The M&M’S Chocolate Bar consists of smooth milk chocolate with whole M&M’S Minis visible in a large bar format and available nationwide in five flavors: Peanut, Milk Chocolate, Crispy, Almond and Crispy Mint. In addition to the M&M’S Chocolate Bar, the M&M’S brand returns for its 12th season in 2019 with Busch and other Mars Wrigley Confectionery U.S. products, which include SNICKERS, Skittles and PEDIGREE. The M&M’S Chocolate Bar Toyota will be on track throughout 2019 Speedweeks in lead-up to next week’s edition of the “Great American Race.” It starts with Sunday’s Clash at Daytona, an exhibition race Busch won in 2012. It continues through next week’s Can-Am Duel qualifying races. Busch won his Duel qualifying race in 2009, 2013 and 2016. Then, the official NASCAR Cup Series season begins in earnest Feb. 17 with the Daytona 500. In addition to his three non-points race wins at Daytona, Busch captured his first and only Daytona points-paying Cup Series win in July 2008. The winner of 51 career races in NASCAR’s Cup Series will look to continue to win races and vie for another championship, with a few other goals still left to accomplish. Along with a Daytona 500 victory and a return to the Championship 4, Busch’s goals for 2019 include securing his second Cup Series championship and earning his 200th overall win in NASCAR’s top three series – he starts the season with 194. So, as Busch and his No. 18 M&M’S Chocolate Bar Camry head back to Daytona for another edition of Daytona Speedweeks, his sights will be set on adding the last important trophy to his collection by becoming the 40th driver to grace the Harley J. Earl Trophy as Daytona 500 champion. With some of the things you accomplished last season, is the Harley J. Earl Trophy that goes to the Daytona 500 champion the one big piece you are missing in your trophy case? Why is the Daytona 500 so difficult to win? How would you explain the feeling of starting the Daytona 500? How important is the Clash exhibition race to learn the draft and get ready for the rest of Speedweeks? Have you taken notes on restrictor-plate races, saying this is what I need to do here? How are you preparing for your Can-Am Duel qualifying race? The 61st Daytona 500 will mark Kyle Busch’s 499th career Monster Energy NASCAR Cup Series start and his 28th points-paying NASCAR Cup Series start at Daytona (Fla.) International Speedway. Busch has career totals of 51 wins, 31 poles, 183 top-five finishes, 269 top-10s and 15,850 laps led in 498 career Cup Series races. His most recent Cup Series win came in November at ISM Raceway near Phoenix. Busch’s most recent pole, the 30th of his career, came in October at Martinsville (Va.) Speedway. Busch has one win, seven top-five finishes and eight top-10s and has led a total of 383 laps in 27 career Cup Series points-paying starts at Daytona. Busch’s average Daytona finish is 19.2. Warmup Act: Sunday afternoon’s Clash at Daytona will mark Busch’s 13th appearance in the non-points event. He brought home his only Clash victory in 2012. In that race, Busch passed three-time Cup Series champion Tony Stewart coming to the finish line on the final lap. Busch won by .013 of a second, the closest finish in Clash history. Dueling at Daytona: Busch will make his 14th start in his Can-Am Duel twin qualifying race Feb. 14. In his previous 13 starts, Busch has led 164 laps and has three career wins in the qualifying race – in 2009, 2013, and 2016. Almost: Busch almost drove to his first Daytona Cup Series victory in July 2007, finishing second to race-winner Jamie McMurray by a mere 0.005 of a second in a drag race to the finish line. No More ‘Almost:’ Busch finally notched his first and only Cup Series points-paying win at Daytona in the July 2008 Coke Zero 400. Busch was just ahead of Carl Edwards when the caution came out for a multicar accident in turn one on lap 162 during a green-white-checkered finish. Busch was declared the winner by NASCAR officials when it was determined his car was in the lead when the caution came out to end the race. 51 Career Cup Series Wins: With his Cup Series win at ISM Raceway in November, the 51st points-paying win of his career, Busch surpassed NASCAR Hall of Famers Ned Jarrett and Junior Johnson to now sit all alone in 11th on the all-time win list. Next up for Busch on the list is Lee Petty, who had 54 wins during his Hall of Fame career. With his 40th Cup Series victory at Bristol (Tenn.) Motor Speedway in August 2017, Busch became the fourth-youngest driver to reach 40 Cup Series wins at 32 years, 109 days, behind only Richard Petty, Jeff Gordon and Herb Thomas. All 23: With his win at Charlotte (N.C.) Motor Speedway in May, Busch has now won a Cup Series race at all 23 tracks at which the series competes, becoming the first driver in the modern era to win at every track where he has made at least one start. Of the 23 different tracks where Busch has won, he has multiple wins at 13 of them. All-Time JGR Wins Leader: With his Brickyard 400 win in July 2016, Busch passed Stewart for most all-time Cup Series wins for JGR. Busch now has 47 wins for JGR to Stewart’s 33 following his most recent win at Phoenix, along with besting Stewart’s Cup Series career win total. 194 and Counting: Busch enters the Daytona 500 with 194 career wins among NASCAR’s top three divisions – Cup (51), Xfinity (92) and Truck (51) – following his Cup Series win at Phoenix last year.